In just eight days, three boats-infested with quagga mussels-almost launched on water bodies in northern Utah. Fortunately, skilled technicians with the Division of Wildlife Resources and Utah State Parks found the mussels before the boats were able to launch. DWR Lieutenant Scott Dalebout, who leads efforts to prevent quagga mussels from spreading in Utah, says the recent incidents illustrate the importance of cleaning, draining and drying your boat after every boating trip. "Quagga mussels have infested Lake Powell," Dalebout says, "and they're spreading across the lake. It's tough to see. We have to join together to prevent what's happening at Lake Powell from happening at another water body in Utah." June 4 - Willard Bay State Park. A technician finds mussels in a boat's motor/water filter (also called a sea strainer). Technicians decontaminate the boat, but because the ballast tanks on this particular boat are difficult to clean, the boat is placed in quarantine at the owner's residence for at least 14 days. June 6 - Hyrum State Park. A technician finds mussels in the bow anchor compartment of a common Bayliner boat. The boat is decontaminated and then released because the simple structure of the boat allows the technicians to effectively decontaminate it. No quarantine time needed. June 11 - Willard Bay State Park. 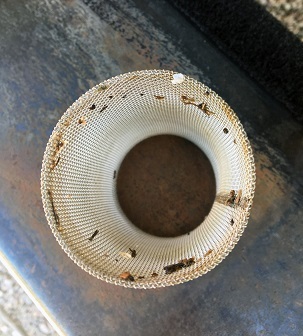 Technicians find mussels in a boat's sea strainer. Technicians decontaminate the boat. The boat does not have ballast tanks, but because mussels are found in the sea strainer-which is full of water and hasn't been dried since the boat was last used-the boat is placed in quarantine at the owner's residence for 7 days. Lt. David Bevridge, who leads the DWR's law enforcement efforts in northern Utah, praised the cooperation he's seeing between the DWR and Utah State Parks. "Technicians with the DWR and Utah State Parks are well trained," he says, "and they're doing a good job of finding mussels. But boaters have to do their part. Please clean, drain and dry your boat and sea strainers after every boating trip, even if you haven't been boating on Lake Powell." The simple clean, drain and dry process-which involves removing debris from your boat, draining all the water out of your boat and then allowing it to dry for a specified period of time-is available at www.stdofthesea.utah.gov. In addition to your boat, Nathan Owens, aquatic invasive species coordinator for the DWR, encourages you to clean and dry any equipment that came in contact with the water. "We're seeing boat anchors, with mussels attached to them, fairly regularly at Lake Powell," he says. Dalebout encourages you to follow the process above, no matter which water in Utah you've been boating on. "Utah's waters are tested for quagga mussels regularly," he says, "but you never know when and where they might turn up. Cleaning, draining and drying your boat-after every boating trip-will help ensure any mussels that might have attached themselves to your boat, or gotten into its water supply, aren't carried to another water. Please clean and dry your anchors and other equipment too."